Well Skittles and Kisses are home owners. Last week thanks to some help from our AWESOME friends we were able to do all the preparations for the house to be delivered. It's good to have friends with heavy machinery. They delivered the house last week. It's amazing this little remote controlled machine whipped their house into place in under 15 minutes. Want to know the rules? 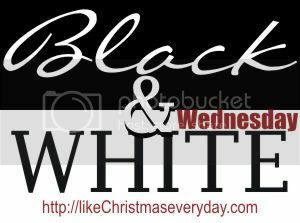 CLICK HERE FOR RULES or you can always click on the Black and White Wednesday menu option at the top. Our esteemed panel of judges will review your photos and choose their favorites. Then Mrs. Claus will post the winners on Tuesday, just in time to remind you to shoot again for the next week! I will email the winner their fabulous blog button to display proudly on their post or blog. yay! congrats to the new homeowners, how exciting! What a very happy time for them. I know they are so excited. This is SO cool! Yay!